electrocoagulation. 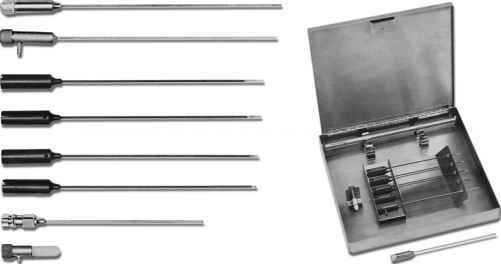 The TIC kit includes a 19-gage Teflon-insulated cannula with 2-, 5-, 7-, and 10-mm tips to create a variety of lesion sizes (Fig. 1). After admission as an outpatient the morning of the procedure, the patient undergoes preoperative laboratory tests, electrocardiogram, and chest X-ray; no food or drink is permitted for 5 h before the procedure. With the patient positioned supine, the surgeon is on the right side regardless of pain location. The fluoroscopy is placed for convenient viewing by the surgeon. Lateral fluoro-scopic images should show overlapping orbits and clinoids and should include the sella turcica, clivus, and petrous apex. The radiofrequency generator is placed for easy access by the surgeon. An adhesive grounding pad or stainless steel plate completes the electric circuit; without a grounding pad, the electrode can monitor temperature but cannot deliver a stimulus or generate a lesion. when the eye is in neutral position. The third point is 2.5 cm lateral to the oral commissure (Fig. 2A). 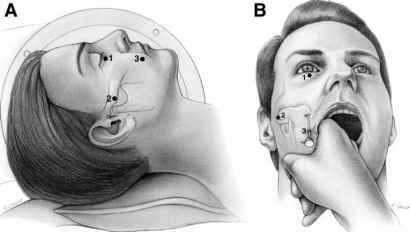 The needle is placed in the retrogasserian ganglion portion of the trigeminal nerve by free-hand manipulation based on the Hartel reference points. After the patient is anesthetized with an intravenous injection of 30-50 mg of methohex-ital (Brevital), a 100-mm-long, 20-gage cannula with a stylet penetrates the skin 2.5 cm lateral to the oral commissure. An oral airway may be placed to prevent closure of the jaw during the procedure. Atropine (0.4 mg) may be given to reduce oral secretions. The surgeon's index finger, placed in the patient's mouth inferior to the lateral pterygoid wing, guides insertion without penetrating mucosa. The needle is aimed toward the intersection of the coronal plane 3 cm anterior to the auditory meatus and the sagittal plane medial to midpupillary line (Fig. 2B). The cannula is advanced based on cine or serial true lateral fluoroscopic images; it then rests 5-10 mm below the sella floor (Fig. 3). Penetration of the foramen ovale by the cannula is signaled by a wince and contraction of the ipsilateral masseter muscle because of contact irritation to the sensory and motor fibers. injury. The herald of carotid artery puncture is pulsatile blood from the cannula when the stylet is removed or when rhythmic fluctuation of temperature occurs during monitoring (18). 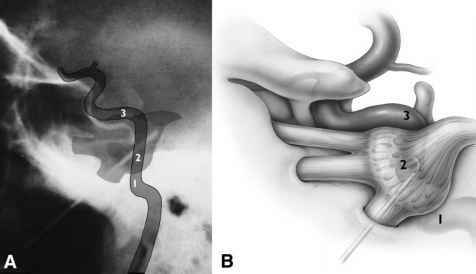 The carotid artery is vulnerable to injury at three sites: the foramen lacerum posteromedially, posterolaterally in Meckel's cave, and the cephalad cavernous sinus (18) (Fig. 4). In the foramen lacerum, the cannula may penetrate the cartilaginous floor; however, Meckel's cave below V3 may lack a barrier of petrous bone. In the event of carotid artery violation, pressure should be applied manually, and the procedure should be postponed for 48 h. Complications of carotid artery injury include hemiparesis from ischemia and carotid cavernous fistula (19). Additional risks include damage to other anatomic structures of the skull base, such as the superior orbital fissure anteriorly and the jugular foramen posteriorly or aberrant foramen near the foramen ovale. Complications of electrode advancement beyond 5 mm proximal to the clivus may include ocular nerve damage or abducens palsy. Cavernous sinus violation may result in trochlear or oculomotor palsy. Confirmation of electrode localization is based on physiological and radiographic evidence. Physiological confirmation is the free flow of cerebrospinal fluid from the cannula and the lack of pulsatile blood flow. The patient should experience facial pain and masseter contraction when the electrode enters the foramen ovale. Facial paroxysms of pain should occur with electrical stimulation between 0.3 and 0.5 V. Impedance measurements of the electrode tip also serve as a localizing data point. Impedance of 150-350 Q is typical of cerebro-spinal fluid bathing the retrogasserian nerve roots, whereas impedance exceeding 1000 Q is characteristic of solid tissue. Radiographic confirmation includes the anterior/posterior projection of a target site 9 mm medial to the lateral wall of the internal auditory meatus, which coincides with the medial dip in the petrous ridge (20). A true lateral projection is useful when one is advancing the electrode until the needle is 5-10 mm below the intersection of a line drawn from the floor of the sella turcica to the clival line. The final target is the intersection of the petrous ridge with the clival line (18). Selective targeting of isolated divisions of the trigeminal nerve root is further defined by radiographic positioning. Division 1 is isolated with a curved electrode directed anteriorly and 5 mm above the clival petrous junction. Division 2 is best isolated with a straight electrode placed at the clival petrous junction. 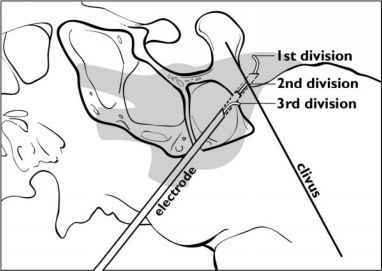 Division 3 may be isolated by placing a posteriorly curved electrode 5 mm below the clival line (Fig. 5). nerves III, IV, and VI. During repositioning, the curved electrode is retracted to prevent mechanical damage to nerves. After its retraction, it may be rotated to a new position that is confirmed by fluoroscopy. After confirmation of electrode physiologic and radiographic localization, the creation of the lesion begins. Anesthesia, administered in 30-50 mg boluses with the short-acting barbiturate methohexital (Brevital), induces somnolence and amnesia without compromise of the airway. 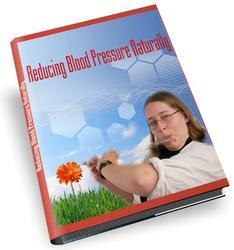 The patient's blood pressure is closely monitored from the time of electrode insertion. Nipride is available in case of a hypertensive induced by nerve manipulation, stimulation, or ablation. An initial lesion temperature of 60°C for 90 s is sufficient for patients who have not undergone treatment by other means. If stimulation thresholds are high, initial temperature requirements may be elevated. After the effects of methohexital resolve, within 2 to 3 min, sensory testing is performed. The goal of sensory testing, which includes pinprick and light touch, is preservation of corneal reflex and touch while inducing analgesia in the trigger zone. Additionally, corneal reflexes and extraocular muscle, ptery-goid, and masseter strength may be checked between lesioning intervals. Every precaution is taken to preserve corneal sensation. If the first lesion results in sensory deficit but not analgesia, further lesion production performed in awakened patients provides the most reliable sensory evaluations. Another lesion-localizing sign is erythema in the trigeminal distribution of coagulation; this occurs in fewer than 50% of patients. Although this physiologic mechanism is not understood, it is a valuable sign that the division is being destroyed. Constant-temperature RFL depends on the heat-conducting properties of the surrounding milieu. The electrode tip may be placed in the retrogasserian ganglion, rootlets, or cerebrospinal fluid. As impedance and stimulation intensities vary, so do fluctuations of current, voltage, and heat to maintain the appropriate temperature. Cerebrospinal fluid is a heat sink, so that as heat disperses, increases in radiofrequency current are needed. Close monitoring of current and voltage aids in resolution of this issue and in the identification of tissue boiling characterized by a rapid rise in volts and sudden drop in current. Postoperative care includes the gradual discontinuation of neurogenic pain medication except for long-term use. Medications are tapered slowly to prevent withdrawal symptoms. Postoperative pain can be alleviated by a mild narcotic and by periodic application of an ice pack to the jaw. The patient is observed in recovery and typically discharged that same day. If oral sensation is diminished, a soft diet is temporarily recommended. Postoperative instructions include meticulous eye care and mandatory use of artificial tears (methylcellulose) if corneal sensation is compromised.